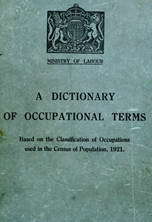 sets or lets "bargains," i.e., measures of rock for stated prices, to quarry men: prices are revised monthly; work usually done by manager (070) q.v. a labourer q.v. who unloads blocks of slate from small trucks, hy hand, on arrival at mills on quarry surface. applies brake to drum of water balance on self-acting incline haulage system; is responsible under overlooker (071) q.v. for correct working of balance; examines external parts daily and reports to overlooker or engineer. cuts deep channel in slate face with special channel-cutting machine, or by drilling line of holes close together. a labourer q.v. who clears away waste left by quarrymen or miners after blasting; clears rubbish from mills; shovels into barrows or trucks. counts slates ready for shipment; usually takes down figures from dresser q.v. ; work often done by slate inspector (071) q.v. a worker (usually labourer) paid time rate of wages. dresses slate, after splitting, with a hand knife or more often, by holding slate against a gauge on a machine and by operating a foot lever which causes guillotine to drop and cut slate to required size. loads slate into wagons or boxes for removal, or for conveyance to another part of quarry; work usually done by slate miner q.v. .
in slate mines or quarries, a brakesman q.v. who operates machinery which hoists slate from mine or quarry. drives horses about quarries drawing tram wagons and carting material where necessary; often also grooms and feeds them. (ii) in very small quarries, may also push, wagons to and from brow or bottom of incline. does odd work in or about quarry; clears rubbish, unloads slate, etc. lands wagons or skips loaded with rock or slate on landing tables at quarry bank, or at end of aerial incline, and pushes wagons or skips from landing tables to haulage way. oils and greases pumps in use at quarries, controls pump by operating various levers and keeps a watchful eye to see that water is coming through. drills the face of slate with hand or mechanical drills, tamps up holes thus drilled and fires shot by means of time fuse, subdivides good slate rock for sending out to slate makers the refuse being removed by labourer q.v. in mines makes and repairs underground haulage roads; looks after supplies of timber or propwood, and clears away rock fallen from roof; in quarries, keeps roads and tram rails in repair and lays down new rails where necessary. drills holes for blasting, or for trial borings in the igneous rock with which slate is interbedded. in slate mines or quarries, drills, blasts ami removes with explosive, beds of volcanic ashes overlying and dykes interstratified with, or cutting through, slate beds. assists as apprentice, or as man not himself capable of taking "bargain", see bargain letter; is given blocks, to make into slates, as remuneration. a pumpman q.v. working at shaft used for raising water in mine or quarry, or for ventilating mine. a labourer q.v. who breaks up worthless slate or stone with sledge hammer, and loads it into trucks for tipping. as for stone cutter (072). in slate mines and quarries strikes top of drill with heavy hammer when drilling "double-hand," i.e., when another man turns drill; obsolescent method . props up roof and sides of roads with timber in underground slate mines. tips rubbish over the spoil heap, makes the tip or heap and keeps it in order. weighs slate or waste as it passes over weighbridge.